Our lungs are essential for life. Their proper function depends on the organization and coordinated activity of many different cell types. As summarized in a recent review (Morrisey and Hogan, 2010 Developmental Cell 18: 8-22) a major challenge is to understand how these cell types are generated during development and how they are maintained during adult life. Of particular importance are the cells making up the branched system of conducting airways that carries air to and from the terminal alveoli where gas exchange takes place. Normally, the epithelial cells lining the airways and alveoli turn over quite slowly and there is only moderate loss due to wear and tear. However, when the cells are damaged by genetic mutation, infection, or exposure to toxic agents there is much more extensive depletion. In these cases, cell loss must be balanced with replacement by the controlled proliferation and differentiation of tissue stem and progenitor cells present within the adult lung. Much of the current work in the Hogan lab is focused on identifying the cell types that build the lung, maintain it over the long term, and repair it in response to injury. We study these processes primarily in the genetically tractable mouse model but ultimately work to translate our findings to the healthy and diseased human lung. To test hypotheses related to the cell and molecular biology of the respiratory epithelium we have generated a number of genetically modified mouse strains. These enable us to manipulate genes in specific cell types, to trace their lineages in vivo, and to isolate them by FACS after recombination of reporter alleles. SFTPC-Cre: This is a transgenic line in which cre recombinase is driven by a 3.7kb promoter fragment of the human SFTPC gene from early stages of lung development (Okubo and Hogan 2004; Okubo et al 2005; Eblaghie et al 2006). We have recently found that on some genetic backgrounds the Cre allele alone can cause lung developmental defects. More information about this is available on request. Sftpc-CreERT2: This is a “knock-in“ allele of the endogenous mouse Sftpc locus and efficiently drives recombination in Sftpc+ cells of the lung. It is not yet published but does not have the same problems as the above allele. Scgb1a1-CreERTm: This is a “knock-in” allele of the endogenous mouse Scgb1a1 locus (encoding the secretoglobin Scgb1a1 aka CC10, CCSP). It has been used to follow the appearance and fate of Scgb1a1 expressing epithelial cells (“Clara” cells) in the airways during development, postnatal growth, steady state maintenance and repair. Using this allele Emma Rawlins obtained evidence that Clara cells in the bronchioles self renew over the long term but do not give rise to alveolar cells during postnatal growth and in the injury models tested. However, our recent work suggests that the cells do give rise to Type II cells during repair after damage by bleomycin (Rock, Barkauskas et al 2011). Please note that the Scgb1a1-CreEr allele labels a few cells in the alveoli that normally also express SftpC. We therefore cannot exclude that these cells are the precursors of the labeled Type II, either exclusively or in addition to cells in the terminal bronchioles. 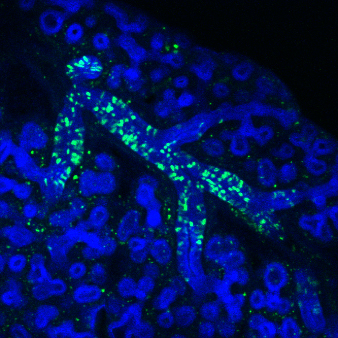 Idb2-GFP: This is a “knock-in” allele of the Idb2 (Id2) locus. This gene is expressed specifically in the distal tip epithelial progenitor cells during the process of branching morphogenesis (Rawlins Clark Xue and Hogan 2009). Idb2-CreERT2: This is a “knock-in” allele of the Id2 locus. It has been used to lineage trace the distal tip epithelial cells at different stages of lung development and to show that they are a multipotent population that can give rise to all epithelial cell types (Rawlins Clark Xue and Hogan 2009). FoxJ1-GFP: A transgenic strain in which a 1kb fragment of the human FOXJ1 promoter drives expression of GFP in ciliated cells. This allele has been used follow the appearance of ciliated cells in the lung during development (Rawlins et al. 2007 Lung development and repair: contribution of the ciliated lineage PNAS 104: 410-417). Figure 3. Section of lung from E15.0 Foxj1-GFP embryo showing appearance of Foxj1 expressing cells in the proximal airways. Note absence of positive cells in the distal branching tubes at this time. Green (immunohistochemistry for GFP (green) and e-cadherin (blue)) From Rawlins et al 2007. FoxJ1-CreERT2: A transgenic strain in which a 1kb fragment of the human FOXJ1 promoter drives expression of Cre in ciliated cells and their immediate progenitors (Rawlins et al 2007; Rawlins and Hogan 2008). Krt5-CreERT2: This is a “knock-in allele of the mouse Krt5 allele. 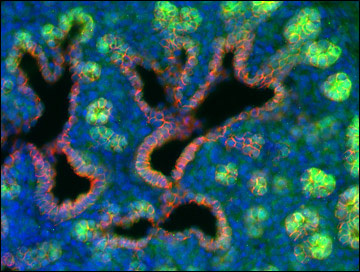 Its use for lineage tracing Krt5+ stem cells in the mouse mammary gland has recently been published in collaboration with Cedric Blanpain University Brussels (Van Keymeulen et al 2011). Tmem16aFlx: This is a conditional null allele of the recently identified calcium-activated chloride channel Tmem16a (aka Ano1). It is not yet published. The trachea and mainstem bronchi of the mouse are lined with a pseudostratified epithelium that contains ciliated, secretory, and basal cells in roughly equal proportions. More distal airways are lined with a simple columnar epithelium containing ciliated and secretory cells but lacking basal cells. We have used our FoxJ1-CreER transgenic mouse line to fate map FoxJ1+ cells of the conducting airways. These data demonstrated that mature ciliated cells are terminally differentiated and do not proliferate or contribute to other lineages during postnatal growth, in steady state adult airways, or in response to epithelial injury (Rawlins et al 2007; Rawlins and Hogan 2008). Previous histological studies suggested that non-ciliated secretory cells of the airways are a proliferative population that gives rise to ciliated cells. To test this hypothesis in vivo, we used an Scgb1a1-CreER knock-in allele to lineage trace Clara secretory cells. We showed that this population functions as a long-term self-renewing stem cell population in the intrapulmonary airways. In contrast, Clara cells in the mouse trachea did not self-renew over the long term but instead were replaced by descendants from another population, most likely the basal cells. Importantly, Scgb1a1-expressing secretory cells (including the putative bronchio-alveolar stem cell or BASC) did not contribute to alveolar lineages during postnatal growth, in the adult under steady state conditions, or in response to alveolar injury (Rawlins et al 2009). Most recently, we have used a KRT5-CreER transgenic mouse line to test the hypothesis that p63+;NGFR+ basal cells function as a population of long-term stem cells in the tracheal epithelium (Rock et al 2010). We showed that basal cells of the mouse trachea self-renew and generate ciliated and secretory cells during postnatal growth, in the adult under steady state conditions, and during repair following epithelial injury. Together, these data support a model (shown schematically in Figure 4) in which distinct stem and progenitor cell populations maintain the different epithelial populations of the lung – the pseudostratified conducting airways, the simple columnar bronchiolar airways, and the alveoli. To fully understand lung development, maintenance and repair it is critical to determine the molecular and cellular mechanisms regulating the differentiation and proliferation of basal stem cells. Towards achieving this goal we have developed a clonal 3-dimensional tracheosphere assay (Rock 2009). Individual p63+;NGFR+ basal cells from the mouse trachea or human airways are seeded in Matrigel mixed with growth medium. Under these conditions, basal cells proliferate and generate multi-cellular spheres that contain a single central lumen. The epithelium that surrounds the lumen resembles the pseudostratified airway epithelium of airways in vivo containing basal cells and differentiated progeny including Clara and ciliated cells. We are using this organoid system to identify factors that promote or inhibit symmetric and asymmetric divisions of basal cells, the establishment of apico-basal polarity, and differentiation. Figure 5 - Individual p63+;NGFR+ basal cells obtained by flow cytometry are seeded in the tracheosphere assay. These cells self-renew and generate luminal daughters that lose expression of basal cell markers (p63, NGFR, KRT14) and begin to express markers of luminal cells (Krt8). The cells polarize and generate a single central lumen that is bounded by luminal cells. Within 3 weeks, the epithelium of the spheres resembles the pseudostratified epithelium of the mouse trachea containing basal, ciliated, and secretory cells. The epithelium that lines the conducting airways turns over less rapidly than the epithelia of organs such as the intestine and interfollicular epidermis. To study the self renewal and differentiation of basal cells in real time we sought a mouse model in which luminal cells are rapidly killed but basal cells retained as a reparative population. A convenient system is inhalation of sulfur dioxide (SO2) gas (Rawlins 2007, Rock 2009). This injury causes the death and sloughing of luminal cells of the tracheal epithelium, but most basal cells and a few Clara cells survive. Importantly, surviving basal cells are not restricted to the submucosal glands in the proximal trachea but are abundant in the surface epithelium along the entire length of the trachea. Soon after the injury, these basal cells take on a squamous morphology to cover the exposed basal lamina and then proliferate. BrdU labeling peaks at 24 hours after the injury (FIGURE 6). Figure 6 - Response of mouse tracheal epithelium to inhalation of SO2. 6 hours after exposure the luminal epithelial cells slough off leaving behind most of the basal cells. These proliferate, with a peak of BrdU incorporation at 24 hours. From analysis of tissue sections these labeled cells are widely distributed throughout the trachea From Rawlins et al 2007 PNAS 104: 410-417. There is also a transient influx of immune cells. Two weeks following the injury the normal pseudostratified architecture of the surface epithelium has been restored with normal proportions of basal, ciliated, and Clara cells and there are no remaining signs of the injury. We have used the KRT5-CreER mouse strain to lineage trace basal cells of the surface epithelium during the reparative process and show that they generate clones containing basal, ciliated, and Clara cells (Rock et al 2009). Importantly, the patches of regenerating cells are distributed throughout the trachea and are not confined to the proximal region This shows that reparative Krt5+ basal cells are distributed widely throughout the pseudostratified epithelium of the trachea. Based on our detailed analysis we believe that the orderly repair that regenerates a normal pseudostratified epithelium in response to injury is an appropriate context for the study of mechanisms that contribute to the self-renewal and differentiation of basal stem cells. Figure 7 - Adult (8-10 week) KRT5-CreER;ROSA26R-lacZ male mice were injected with Tmx to induce recombination in basal cells of the trachea. One cohort of animals was exposed to SO2 to injure the epithelium while control animals were left unexposed. All animals were sacrificed two weeks later. (Top) Whole mount images of ventral tracheal epithelial surface after X-gal staining (blue) to show the lineage-labeled basal cells and their descendants. (Bottom) Paraffin sections of X-gal stained tracheas stained with an antibody against acetylated tubulin (black, a marker of multiciliated cells). Arrowhead = labeled ciliated cell; arrow = labeled Clara cell. Note that after the SO2 injury, patches of labeled cells are abundant in the surface epithelium and are not restricted to specific regions such as near the submucosal glands. In contrast to mice, the pseudostratified epithelium containing abundant p63+;NGFR+ basal cells lines the airways of human lungs right down to the alveolar duct. This is important because a number of human airway diseases are associated with pathological remodeling of smaller, more distal airways (Rock et al 2010). We have shown that basal cells isolated from small human airways (~2mm diameter) both self-renew and generate ciliated and secretory cells in our 3-D culture assay (Rock et al 2009). This suggests that basal cells from human airways, like those from the mouse trachea, represent a population of classical stem cells. We are combining transcriptional profiling of normal and pathological airway epithelial cells with in vitro culture and genetic manipulation to identify mechanisms that contribute to conditions such as mucous hyperplasia, squamous metaplasia, and lung cancer. Figure 8 - Section of a small airway from a normal human lung. p63+;NGFR+ basal cells make up approximately 30% of the total cells of the pseudostratified epithelium. (Bottom) Section of a small airway from a patient with COPD showing adjacent regions of relatively normal psuedostratified epithelium (left) and squamous metaplasia (right). Most basal cells in the normal airway express cytokeratin 5 (KRT5) but not KRT14. In contrast, basal cells in regions of squamous metaplasia express both KRT5 and KRT14.